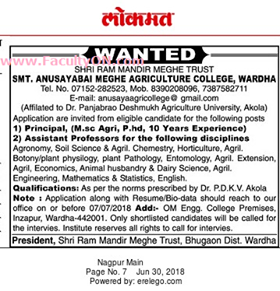 Smt.Anusayabai Agriculture College, Wardha has advertised in Lokmat for the recruitment of Assistant Professor jobs vacancies. Interested and eligible job aspirants are requested to apply with in 7th July 2018. Check out further more details below. College Profile: The Trust has around 105 Acres of Land at Bhugaon, Dist. Wardha, About 8 Km From Wardha main Railway Station And College is in the Wardha City. 10 Acres Land At Borgaon (Meghe) Arround 2 Km from, Wardha Main Railway Station, Where Net-Shed is installed and other Demonstration/Practicals take place. The main college building is at Kelkarwadi, Arvi Road, Wardha , around 2 Km from Main Wardha Railway Station.